The giraffe (Giraffa camelopardalis giraffa) is often passed by, by those either on safari for the first time after a few encounters or by those who like me spend a great deal of their time in the bush. The giraffe is one of my favourite and most interesting of animals to photograph as you can normally get quite close to them, especially in the Kruger National Park wher I take a lot of my photographs. Giraffe has many ticks against its name, besides being the tallest land animal they are for instance the tallest of the even toed 'ungulates' and also the largest 'ruminant'. 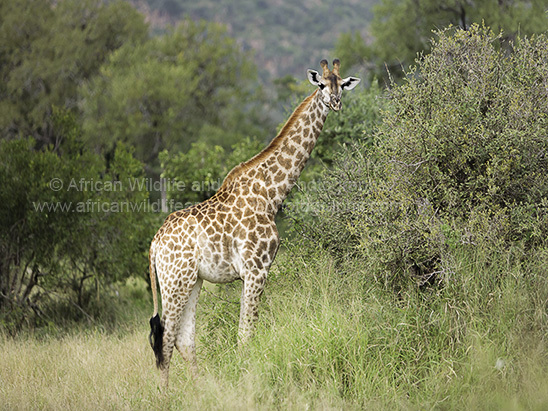 Their are around 9 sub-species of giraffe but the one shown below is the South African Giraffe (Giraffa camelopardalis giraffa).